Wolseley House which contains the Tourist Information Centre was named to commemorate the invention of the shearing machine by F.W. 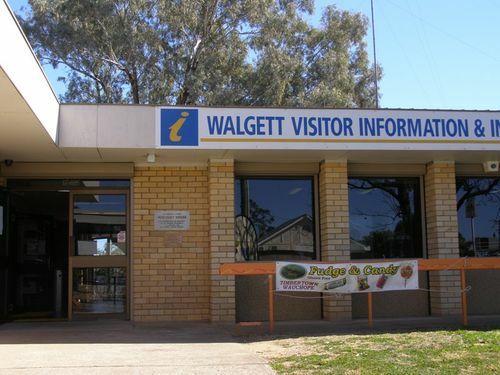 Wolseley of "Euroka" Station Walgett. Frederick York Wolseley (1837 – 1899) was an Irish-born New South Wales inventor and woolgrower who invented and developed the first commercially successful sheep shearing machinery. It revolutionised the wool industry. In 1871 he acquired Toolong in the Murrumbidgee district, five years later another property, Euroka near Walgett. Now living at Euroka, he continued testing and on 28 March 1877 he and Robert Savage (1818–1888), the inventor of various items of mining and agricultural machinery, were granted a patent. Another patent was granted in December; however their machine was not a success and Wolseley continued to work on it but without Savage. He made further developments with Richard Pickup Park and they patented an 'Improved Shearing Apparatus' on 13 December 1884. The following year, Wolseley bought John Howard's rights to his horse clipper and hired him to work as a mechanic on his Euroka station. There Howard made improvements that were so effective that Wolseley began public demonstrations in Sydney and at Euroka. A William Ryley made suggestions for improving the handpiece. In 1887–1888, demonstrations were arranged throughout eastern Australia and New Zealand. The culmination was the first complete shearing by machinery which took place at Sir Samuel McCaughey's woolshed at Dunlop, Louth, N.S.W . and that year, 1888, eighteen more woolsheds were equipped with Wolseley machinery.